But this Everton side was a different animal to anything else in the division and we basically beat United into submission. Andy Cole and Mark Hughes were getting no change out of Watson and Unsworth at the back and Ince and Keane couldn't compete with Ebbrell, Horne and Parkinson in the middle. But it was Ferguson who made the real difference. Bruce and Pallister couldn't cope with him as he battered his way through the United defence. He was winning every aerial battle and his goal eventually came on 58 minutes. Again, it was a header at the Street End. Again, it was from a cross by Andy Hinchcliffe. Again, the Blues went on to beat a bitter rival! But the goal will probably be best remembered for the big man's celebration. 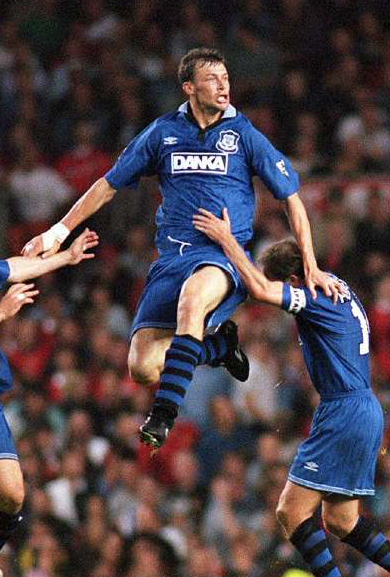 As Schmeichel picked the ball from his net, Dunc ran past the Gwladys Street and up past the Main Stand, pumping his biceps and twirling his shirt around his head. The memory is almost in slow motion sepia tones…like Bo Derreck in Ten…but better! It was also one of the rare occasions that the big man didn't pick up a caution, but it was back in the days when you could celebrate a goal without getting booked. The rules about taking your shirt off had to change a few years later though when Ryan Giggs pulled a similar stunt in the semi-final against Arsenal. *shudders* Footage of that celebration should be burned…along with Giggs' chest hair!